Endurance (1914) lost in Shackleton's Dash to the South Pole. 039. 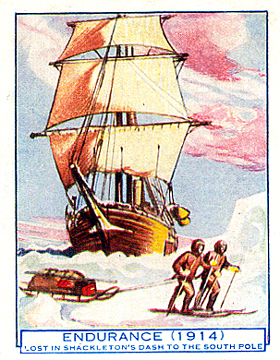 ENDURANCE (1914) LOST IN SHACKLETON'S DASH TO THE SOUTH POLE. Issued by D.C. Thomson & Co. Ltd. (Date: ?). Card unnumbered; from a set of 32 entitled "Famous Ships". Size: Ca. 2.5" x 3.1". Recto: View of Endurance beset in the ice with two men on skiis hauiling a sledge. Verso: FAMOUS SHIPS | ENDURANCE | In 1914, soon after the beginning of the Great War, The Endurance left Britain under the command of Sir Ernest Shackleton to conquer the icy waters that fringe the South Pole.